Anyway, we were discussing inspiration. So this dish was inspired by my good friend Lisa. 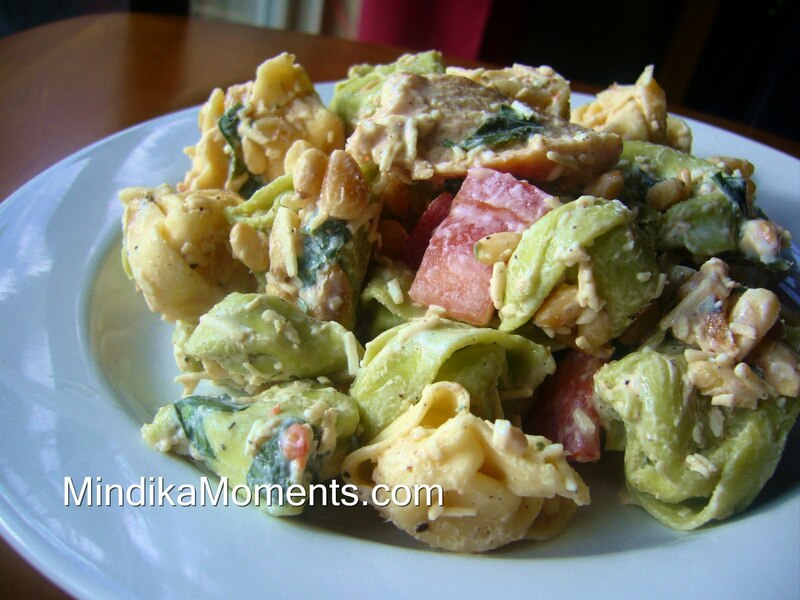 she brought a really yummy tortellini salad to our 4th of July BBQ. Believe it or not, I had never cooked tortellini before. I've eaten it in restaurants, but never cooked it or had it at home. Lisa's salad was so good, I just had to do a little experimenting of my own. This is what I came up with. I'm a big fan of tortellini now and plan to try a few more ideas in the near future....stay tuned. 1. In a zip lock bag or bowl, combine the chicken, lemon juice, vinegar, oil, garlic powder, salt & pepper. Allow to marinate for at least 30 minutes or up to 4 hours. 2. Grill the chicken, then allow to rest for 10 minutes. Slice thin and set aside. 3. Cook the tortellini according to package directions. Drain, and set aside to cool. 4. When the chicken and the pasta are cool, Toss together and add the nuts, basil, cheese, tomatoes and dressing. Mix until well combined. 5. Eat immediately or allow to chill in the refrigerator for up to 1 hour. If you’re making it the night before and plan to take it to a party or event, you may want to wait to add the dressing until right before serving, or you can just add a little more dressing later.